Dower chest carved 1912 for Marie Whitesides . Who was Nellie Payne? Dower chest for Marie Whitesides. 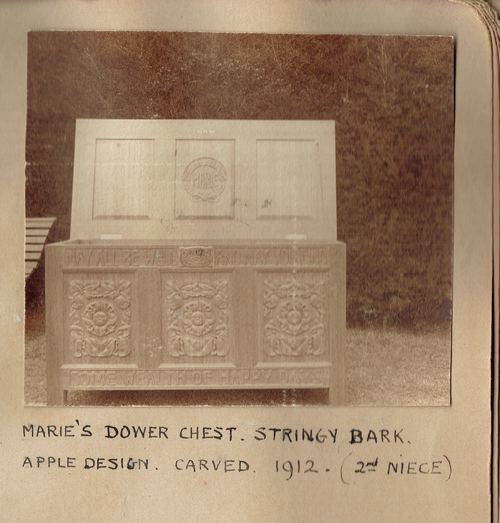 This is a dower chest which was carved by Nellie for Marie Whitesides. Marie was born in 1890 to Sara Jane (née Field) and Edward J.C. Whitesides; therefore she was Nellie’s niece. Marie married Charles Davies in 1913, gave birth to a daughter Patricia Davies in 1914 and sadly passed away of meningitis seven months after the birth of her daughter. It is assumed that Nellie carved this chest for Marie and Charles’ wedding. The current whereabouts of this chest is unknown, although we do have a photo of it from Madge’s scrapbook. Atkinson lists two chests for Whitesides – one for Marie and one for Laura. Laura Lavinia Whitesides lived from 1856 and died in 1933. She did not marry nor have any children. Her brother was Edward J. C. Whitesides who married Nellie’s sister Sara Jane Field (1856-1941). If there was one carved for Laura, then it is not known what happened to this chest, nor have we found a photo of it anywhere.